George Frideric HANDEL (1685-1759) (attr. 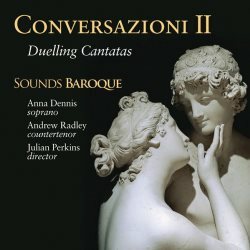 This is the second disc Sounds Baroque has devoted to repertoire performed during the conversazioni of the Arcadian Academy in Rome in the decades around 1700. This circle of aristocrats, poets, musicians and artists was founded in 1690, and the model was soon copied across Italy. The gatherings of the Roman academy took place on Sunday afternoons in the palaces of its aristocratic members. It was during such conversazioni that the vocal and instrumental music recorded here might have been performed. Obviously we, for the most part, don't know exactly which music was sung and played, but the composers included here were all in Rome or had connections there. That makes the performance of these pieces plausible. The first disc was devoted to solo cantatas while the thread of the present volume is the duet. That is expressed in the subtitle: 'Duelling Cantatas'. Today this genre seems a little under-exposed: there are many more concerts and recordings with solo cantatas than with duets. However, in the time of the Scarlattis and Handel this was a very popular form of musical entertainment. The duet could indeed circle around a conflict - or at least a dialogue - between two different characters. The duets by Gasparini and Handel belong to that category as their subtitles indicate. Alessandro Scarlatti's cantata is different: here the two singers represent only one protagonist who uses the singing of the nightingale as a metaphore for a lament about a lost love. The disc opens with a cantata by Francesco Gasparini, one of the lesser-known composers of operas in the early 18th century. In 1716 he became maestro di cappella of Prince Ruspoli, one of the members of the Arcadian Academy. Gasparini himself became a member two years later. The cantata Io che dal terzo ciel is a specimen of a duet in which there is no conflict between the two characters. On the contrary: they express their eternal love, and this lends this piece a great amount of elegance and refinement. The two parts for violins are treated in different ways. In some arias they play ritornellos, in others they are fully integrated. Notable is the imitation of the nightingale by the solo violin in the duet at the end. It is nicely sung, but too restrained. Both singers could have given their respective characters a stronger profile. That goes even more for Handel's cantata Amarilli vezzosa which is far more dramatic because of the conflict between the protagonists. It is one of Handel's best-known duets and has been recorded several times. This is not the most dramatic interpretation I have heard. It is again nicely sung, although both singers should have used a little less vibrato. However, a 'nice' performance is not the main thing required here. This cantata is quite close to opera, and that aspect doesn't come off here. The singers are again too restrained, and the playing of the strings too restrained. The transition from allegro to adagio in the opening sinfonia is not dramatic enough. In the recitatives there are several moments where the soloists should have done more with the text. The most satisfying part of this disc is the cantata by Alessandro Scarlatti, who worked in Rome and Naples, and was also a member of the Arcadian Academy. His cantata Questo silenzio ombroso is a lyric piece and is perfectly realized here. Especially beautiful is the last section. In the second section the balance between the voices is not entirely satisfying as Anna Dennis is a bit too loud and as a result overshadows Andrew Radley. This disc is not only about duels between two characters, it is also about a historical duel: between Handel and Domenico Scarlatti. The keyboard pieces in the programme have been selected to document a contest which, it is assumed, took place shortly after Handel's arrival in Italy. It is reported that Handel was declared the winner on the organ, whereas Scarlatti won the contest on the harpsichord. The musicologist Graham Pont believes that Scarlatti's Sonata in G (K 63) and Handel's Sonata in G (HWV 579) have their origin in improvisations forming part of this contest. Interestingly Scarlatti's sonata is preceded here by the Rondeau in G which is attributed to Handel. There is a strong similarity between the two pieces; the opening statements are almost identical. If Handel is indeed the composer of the Rondeau it is an intriguing question who was paying tribute to whom. The dates of composing are apparently not known. Julian Perkins gives no indication in this regard, and it may be impossible to say which of the two pieces was written first. Considering that Scarlatti was chosen as the winner on the harpsichord it seems a bit odd that the Sonata KV 63 is played on the organ. This is definitely a most interesting disc as it gives us some idea of what a conversazione may have looked like in musical terms. The fact that the choice of music is obviously speculative doesn't diminish its value however, the performances do, in some respects. There is much to enjoy as I have indicated, but part of the repertoire doesn't receive an ideal performance. The Handel cantata is the least satisfying, but fortunately there are several recordings on the market which may offer a good alternative. The cantatas by Gasparini and Alessandro Scarlatti are nice additions to the catalogue.